You might this is strange, but I shop for Christmas gifts all year round. In fact, I’ve already purchased most of the gifts I’ll be giving to others this Christmas. As many long-time readers know, It’s one of the main ways I avoid going overboard when it comes to the holidays. I typically stick to the 4 gift rule for my kids. However, shopping for Christmas gifts still takes time. It still costs money, and it definitely still takes planning. Yes, I mean that I shop for Christmas gifts in the middle of the summer. In fact, this summer I snagged some sweet holiday deals for all of my nephews and niece. I scored my son’s “big gift” from Santa in the middle of the summer as well. By keeping an eye out for Christmas gifts all year round, I not only save myself time but I also save myself a lot of money. The holiday season is hectic enough already, and the more I can avoid the mall, the better. Santa is making a list and checking it twice, and you should too. Before you start planning for the holiday season, make a list of everyone you want to buy presents for. Don’t forget about your children’s teachers and coaches too. You can keep this list in your planner, on your phone or in your Google Docs. As you go about your normal shopping to the grocery store, the mall, and of course, Target, keep your family and friends in mind. I recommend always browsing the clearance sections for holiday deals. You never know when you’ll find a really great item on clearance at drug stores and even your grocery store. Keep an open mind. Remember, every gift you give doesn’t have to be designer. It just has to be thoughtful. Some of my favorite places to shop are Amazon, T.J. Maxx, Home Goods and Burlington Coat Factory. Many of these stores sell items that are new yet heavily discounted. Most people prefer to get a new gift for Christmas, so these are great places to shop for Christmas gifts all year round. Just recently, I bought a high-end pair of rainboots at Burlington Coat Factory for 80 percent off retail price. T.J. Maxx and other stores mentioned in this section all have great purses, stationery, pictures, organizers and more. Marshall’s is a great place to buy Melissa & Doug toys for less than you can get at big box retailers like Target. Again, all of these items are nice, new and inexpensive. If you frequent these stores to buy things for yourself, browse and see what you can find. Online stores (like Amazon) are another great place to shop for Christmas gifts any time of year. Plus, they’re so convenient since you can shop from the comfort of your couch (or coffee shop). If you look for holiday deals online (and you should), consider using Ebates, as they make it easy to earn a little cash back on your shopping – making it a win-win for you! Again, you should have your comprehensive list of people you want to buy presents for, so keep it in your pocket or on your phone. Then, if you see something you know your family member or friend will like, buy it and save it until Christmas. This entire method of shopping for Christmas gifts is all about long-term planning. So, don’t forget about the wrapping paper, cards and gift tags. The best time to purchase these items is actually right after Christmas. I know that Target drops prices on holiday items down to 50 percent right after Christmas, then 75 percent, and then 90 percent. Interestingly enough, Target has a lot of furniture and decor that counts as Christmas items now. Last year, there were lots of pretty side tables with marble tops marked down 75 percent. Of course, I had no real need for them last year, but if you’re looking to buy some home decor pieces as well, remember this tip! Ultimately, the key to keeping stress low during the holidays is to plan ahead. 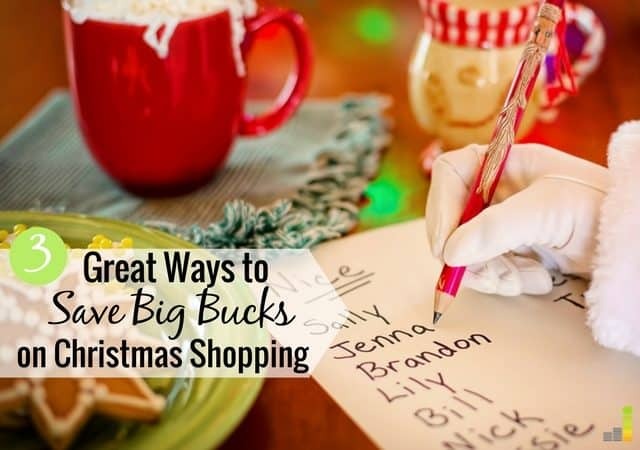 If you shop for Christmas gifts throughout the year, you won’t have to stress about money during the holidays, and that is a big gift in itself! When do you shop for Christmas presents? 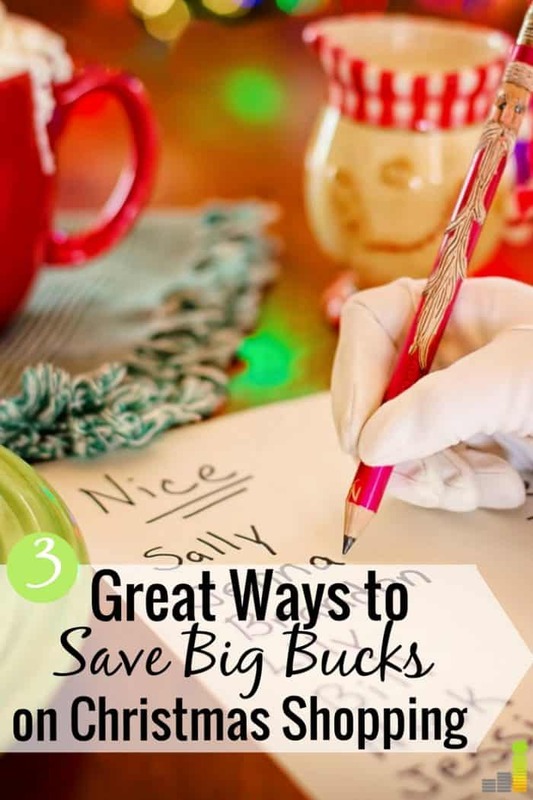 Do you try to stick to a Christmas budget? Do you try to shop for Christmas gifts all year round? What’s your biggest tip to surviving the holiday season stress-free? My problem with shopping early for gifts is that you might not necessarily get what is the right gift by the time Christmas rolls around. Then, you’re stuck with it as you probably can’t return it if you bought it six months ago. So while you can save money, the risks associated with it usually aren’t worth it for me to shop months ahead. Instead, we save every month so that we’re fully funded for our gift purchases and don’t have to worry about how to pay them off. I echo Money Beagle, but it hasn’t happened too much with the gifts we’ve bought well in advance of Christmas. Some things are easy “go to” gifts, not just for Christmas but other occasions (I’m thinking something like a coffee mug). It’s a risk buying in advance of course, but overall I think it’s worth it.